Cisco Systems [yesss I love this company, coz that’s where I had my first internship 10 years ago!] 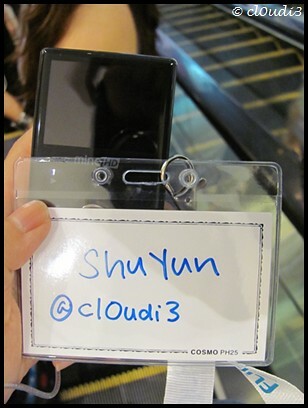 recently launched a new Camcorder in Singapore. Camcorders might seem common these days, but a pocket camcorder? That was what attracted me! But I was pretty skeptical on the video output. Will the quality be comprised? So we took the Flip Video™(s) and went around doing some “testing”. Did this indoor, at the dining venue. And this was taken outdoor, at the open area of VivoCity at 3rd floor. Doesn’t seem to impress me much actually. But I’m pretty cool with it, seeing that it’s a compact camcorder. It’s good for play use! Not until.. I saw the “Watch in HD” mode on youtube! haha oops! It’s nice of the organisers to have a “choose the correct flip and u get to own it” game. Yes I won it ahhaha! Take a closer look at 0:52. I’m impressed by how the video auto adjusts the brightness as it moves. Oh! I haven’t show you the size of the camcorder right? Here you go! The name tag is the normal credit card size. That’s how small the Flip Video™ is (the one in the backdrop is MinoHD™)! More info on Flip Video™ on the official site. Finally, thank you Julian from Text100 for the invite! Yup this is the theme song, Still by Lee Hong Ki from F.T. Island. With the recent debut of the drama in Taiwan, Lee Hong Ki offered to do a mandarin version of the theme song!